This diver operated dredge pump can be electric or hydraulic powered. Run 1, 2 or 3 dive operators at once. Call about your specific project so we can match your job to the right EDDY Pump equipment. Submersible Diver Operated Dredge System. Our Diver Operated Dredge design is easily mobilized and designed for pumping production rates of 75 to 150 cubic yards of material per hour. This while pumping a higher solids content and not clogging like conventional pumps. Units are fully submersible and are stationed on the lakebed or ocean floor. Units can be powered electrically or hydraulically. One system can allow one, two or three suction hoses and divers to operate simultaneously. Over 300-ft of suction hose can be added to the pump, providing versatility not found in conventional diver operated dredges. This allows for the easy mobility into pipelines for difficult dredging applications. With the EDDY Pump Diver Operated Dredge, you do not need booster pumps as you can easily pump over 2500-ft.
All our diver operated dredges utilize our patented pump technology that outperforms all centrifugal, vortex and positive displacement pumps in a variety of the most difficult pumping applications. 4-Inch Diver Operated EDDY Pump Dredge, transporting sand at a project in Mexico. 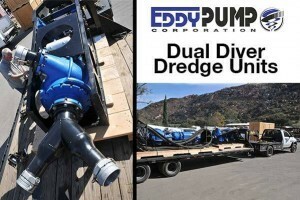 All EDDY Pump dredges and diver operated dredge units use our patented USA Built industrial pumps. With references from Discovery Channel’s Bering Sea Gold talking of the Subdredge, “There are truly no limits for this Subdredge”. After 4-weeks of operation under the 5-foot thick ice of Nome, Alaska, the Subdredge can truly be seen as the new wave of the future in underwater gold mining and will soon be seen by millions on the Discovery Channel! The same can be said for the Diver Operated Dredge that uses the same pump. EDDY Pumps power all of the equipment in our lineup. The diver unit in most cases is a modified Excavator Attachment Pump setup with a new head unit for dive dredging. This provides your operation with a tool that can be used for multiple applications at a job site. Call for information. We used both the electric and hydraulic style pumps for diver assisted dredging. Both pumps operated continuously for over 45 days at 10+ hours a day with no problems at all. The only issue we had was a large fishing net wrapped around the impeller. Although it was making one hell of a racket, the pump never lost production. We are extremely happy with the pumps and the service provide by Eddy. A must purchase for any diver assisted dredging products.